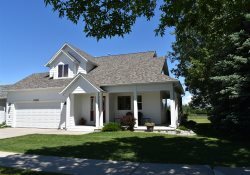 Close to Bozeman Ponds, 1 block from the new 'Lewis & Bark' Off Leash dog park, the mall on Main Street, this house puts you within a 5 minute drive to Montana State University and shopping. You can quickly get out of town and head out to Big Sky, Yellowstone, and the rivers. Don't feel like renting a car? Streamline bus routes have a pick up 40 yards from this home and also has late night pick up. There is also a new off leash dog park that is 200 yards from the house! There is a main floor master and 3 bedrooms upstairs. It backs to school ball diamonds (to the North) so there are great views of the Bridger Mountains. Enjoy the wrap around porch and patio out back. There are numerous windows but how the home is situated with neighboring homes offers a lot of privacy without shutting the blinds. This is the second vacation rental the owners have purchased. They have done a bit of remodeling with adding gorgeous white oak hard wood floors through out the main level, updated lighting, new blinds, This house sits in a great central location but gets you out of town quick if heading to the rivers, Big Sky, or Yellowstone. It has a main floor master and 3 bedrooms upstairs. The living room and kitchen are open with the 2 story living room opening up the the upstairs loft and other bedrooms. It backs to school ball diamonds so there are great views of the Bridger Mountains. This is a very comfortable home for sleeping 8-10 people. There is an attached 2 car garage that can be used by guests as well as parking on the street. There is a washer and dryer which can also be used by the guests. Appreciated Taylor's quick response when I first checked in (had trouble getting in the door) and she responded quickly to a couple other issues we had. She was great to work with! Relaxing and fun for all of us!! We would recommend this property to anyone, location is great and the house very nice!!! The property was perfect size and location. We had enough room to relax and visit with family, cook together and share meals around the table, and our dog enjoyed the space outside to run and explore. The only negatives would be the gas grill did not heat up to high enough temperature so we had to finish cooking indoors; the master bath had no hand soap so we purchased one and left for next guests; and the sliding glass door did not lock- there is a chain lock in place, but one could easily open door from outside and reach in to unlock chain. Everything was perfect, thanks for letting us check in early. We enjoyed every part of our stay. Great house! We loved our trip to Bozeman and this house was perfect for our family. It was very clean and well maintained. The kitchen had everything we needed to cook too. Highly recommend this home! No single comfort spared in this home away from home! Everything was seamless. A great place for a family gathering. Smooth check in/ check out; we experienced no problems. The house worked well for our needs. It was nicely decorated for the season. Loved having the Christmas tree and lights in the living room. We enjoyed sharing Christmas with family. Thank you for sharing your lovely home. There is an extra $40 cleaning fee for groups over 6 people.